Here's a save-the-date that I never got around to posting about from last year and since the fall is coming I thought I would go ahead and post it now. Looking at the photo, I'm pretty sure I didn't post it because I wasn't happy with my shots of the actual save-the-date, but oh well. Hopefully you get the gist of it! Alex called me one Saturday afternoon. Typically I stop taking appointments by 1:30PM so I can share the day with my family but I made an exception this time. She couldn't come by until 2:30 or 3pm so I agreed. She and her fiance came by regarding save-the-dates for her wedding. She knew exactly what she wanted and her colors. Her theme was fall leaves and her colors were copper, gold and creme. She wanted leaves and she wanted a little more flair for her save-the-dates. So we used a gatefold and created a seal for the save-the-date. 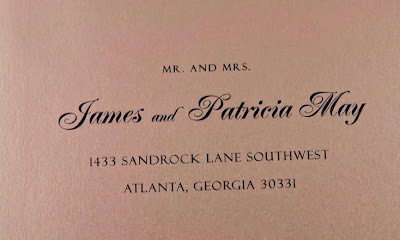 Her envelopes were gold and we addressed them using the same fonts from the save-the-date to match. I think they came out great! 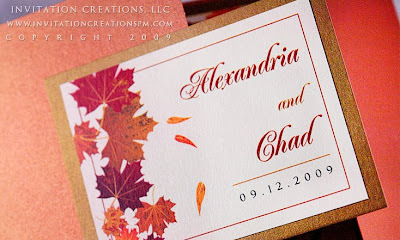 These are great colors for a fall invitation! 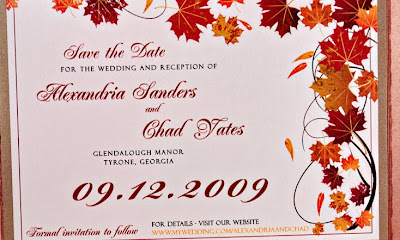 Do you print your invitations yourself? To provide the best quality product possible for my clients, I have them professionally printed.